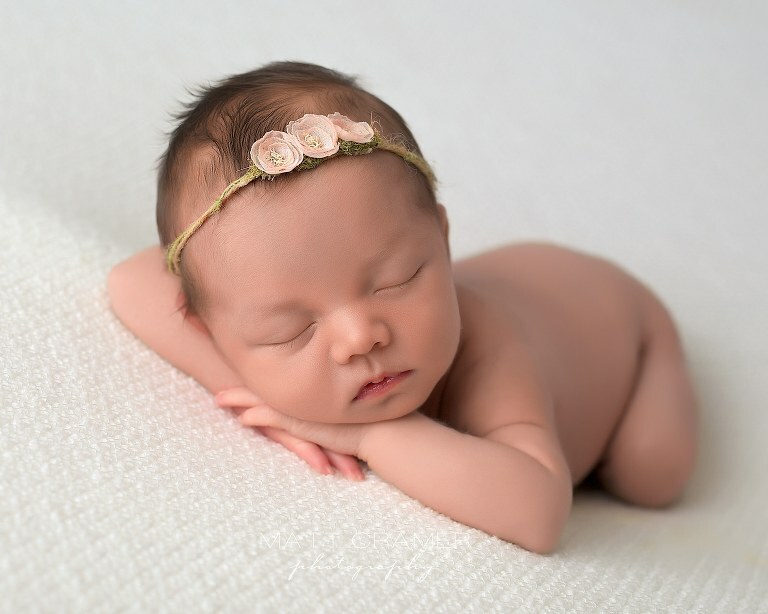 Since this beauty slept so well for us, we were able to get an awesome variety of looks during her newborn session with us. When baby is sleeping so well, it can be hard to stop shooting! In fact, I know it was really hard for mom and dad to narrow down their final selections! They had such a nice selection to choose from in their proof gallery. Below are some of our favorites from this Los Angeles newborn photography session! In our newborn sessions, we often like to start out with clean, simple fabric “bare” baby shots. The all neutral set up always looks so angelic against a new baby’s skin. Here I accented the look with a simple dried floral headband and soft cream angora wrap. This fabric from Roses and Ruffles has such a great, understated texture, too. From the previous pose, we gently moved her into another adorable newborn photography pose. Newborn photographers sometimes call this the “womb” pose, as baby is curled up similar to how they were inside the womb. One of our favorite pink headbands from Goodnight Moon Props completes the look! Last pose on the fabric was this head on shot. Parents almost always choose this pose as a favorite. This shot is a beautiful close up of their baby’s face. Look how peaceful and relaxed baby is. This should be what new parents are looking for in a newborn photographer’s portfolio! It is so important that baby is comfortable and relaxed in their photos. After fabric poses, we move on to our props shots. In this set up, we used our driftwood bowl that cradles baby perfectly. You can’t see it, but there is nice soft little “newborn” pillow under the material in the bowl. Newborn safety is a huge priority for us. We insist that all newborns are posed safely and comfortably. Mom made a last minute request to add in this mint colored felt from Ababa Baby, once she saw our prop rack! I’m so glad she did, because it came out beautiful! A newborn session with us would not be complete without a macro shot of baby’s toes! The background was changed for this next prop set up, and we used soft peach accessories. The dried floral headband with peach accents tops off this look. This is my favorite image from the entire Pasadena newborn baby photography session! How beautiful is her little face?! She was so content to have her toes right up near her chest. She slept so peacefully like that the entire time. All the texture in the set up combined with the different tones of grey came together perfectly. I always like to use dainty headbands like this one from Edna Magdalene. Macro shots of baby’s eyelashes always turn out so beautiful. Parents often choose these shots as the cover of their heirloom newborn album or for a dramatic large print in baby’s nursery. Aerial shots show a different perspective and more of a “bird’s eye view” of baby all snuggled up. She looks so comfy all swaddled up. Her parent’s perfect bundle of joy! This baby stole our hearts! The sweetest, sleepiest, gentle little soul. The newborn photo session ended with this dusty pink look. We even caught a smirky smile too! I love incorporating a pink and cream look that isn’t overly done or too frilly. The dried floral halo and soft swaddle wrap combine perfectly. Her smile tops it off!